It comes in a small (20ml) plastic tube with a grey screw on top, beneath that there is a removeable metallic foil seal to protect the contents. "The fruit of the Devil’s Apple plant (Solanum Linnaeanum) has been suspected in stockman’s folklore as a treatment of eye cancer in Hereford cattle. It is folklore that brought the plant to Dr Bill’s attention and had him begin over a quarter of a century of research. He set out to discover the active compounds of plant. His discovery led to the patenting of purified glycoalkaloids mixture, which is known as BEC. He subsequently established that the BEC was also present in edible fruit such as the eggplant or aubergine (Solanum Melongena)." "Curaderm is 99.8% natural with a tiny amount of preservative added. The active cancer destroying agent is solasodine glycosides, 0.005%. Solasodine is derived from the “Kangaroo Apple” and is in the same family as eggplant. Another well known ingredient is melaleuca oil, 0.1%, which is an anti-microbial from “tea tree”. Linoleic acid, 0.05%, a polyunsaturated fat found in canola oil is present as well. Urea, 5% is to increase the amount of water in the skin. As the cancer cells die, they are encouraged to slough off by the action of salicylic acid at 10%." Yes, the active ingredient in BEC5 is found in eggplants (if you're from the USA) or aubergines (if you're from the UK) and Solanum sodomaeum, also known as Devil's Apple. When I read that this cream was 99.8% natural, made from plants, and was an effective basal cell carcinoma treatment, I was very scepitcal to say the least, however given that the alternative was to have surgery and have a skin graft over nearly 50% of my forehead I was willing to try it. 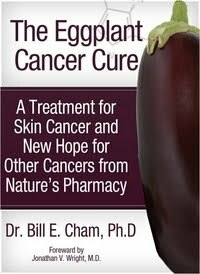 Dr. Bill Cham has written a very interesting illustrated book about the history of BEC5 called "The Eggplant Cancer Cure" I read it before I started the treatment and it gives a fascinating insight into the background discovery of BEC5 by Dr.Cham. The book is available for free (at the time of writing this) Click on the book cover below to be taken to the Curaderm webpage where you can download it (.pdf) You just have to give your first name and your email address to receive it by email, it's a interesting and informative book and helped me with my basal cell carcinoma treatment. It will probably answer all the questions you have about Curderm and if it doesn't, you can contact Curaderm direct and they will answer your questions. I contacted them on just one occasion and got a prompt reply from a real person, not a canned auto reply.